I must admit that I have been contemplating this post for quite some time. To be honest, I have been hesitant about it because of people’s overwhelming affection for ficus trees (Ficus nitida). 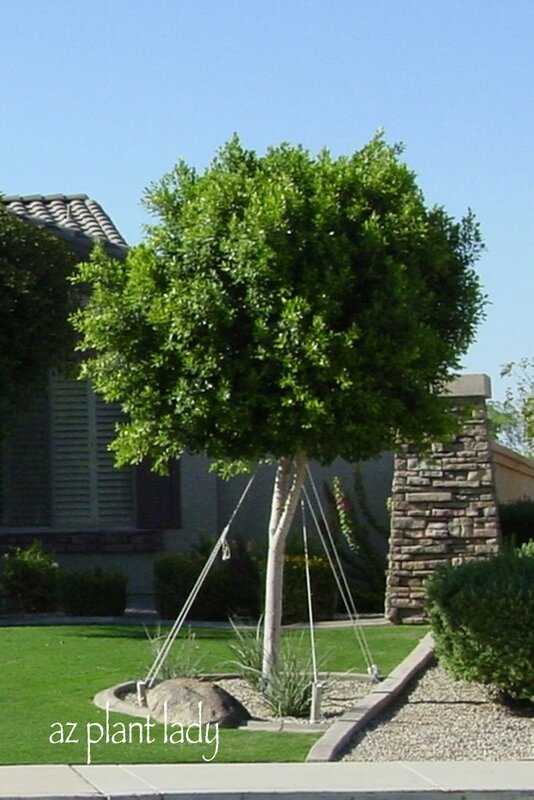 At first, the benefits of planting a ficus tree are obvious. They are lush, beautiful and provide dense shade, which is sometimes scarce in the desert. So what’s the problem with having a ficus tree? Well there are a couple of things that you should be aware of before you plant a ficus tree. First, is the fact that they do suffer frost damage in the low desert when temperatures dip below freezing. It can be worse when consecutive days of freezing temperatures occur. This past winter, we had temperatures in the low 20’s for three days in a row and the damage to the local ficus trees was noticeable. I could drive through any neighborhood street and tell from a distance who had Ficus trees and who didn’t by simply noting the ‘brown’ trees. Once the warmer temperatures came back, there were quite a few ‘short’ ficus trees seen around the neighborhood due to the frost-damage branches being removed. Ficus tree that had frost damaged branches removed. The second problem that sometimes occur when people don’t research how large ficus trees will become. They are soon caught unprepared when the pretty, shade tree that they planted soon grows so large that it almost seems like it is ‘eating’ up the house…. So, what should you do if you absolutely love ficus trees and want one in your garden? By all means, buy one. Just know that you will have some winters where it will suffer frost damage and will look unsightly until new branches grow in. Also, be careful where you plant it. Allow enough room for it to grow so that it doesn’t ‘eat’ your house. In addition, keep it away from patios and pools or its roots can become a problem with shallow watering. It can grow 30 – 50 feet high and 40 feet wide. Some people look to sissoo trees as an alternative to ficus. The sissoo tree (Dalbergia sissoo) is similar in appearance to the ficus tree, but they do have greater tolerance to frost. Like ficus trees, sissoo trees do grow quite large but I no longer recommend them for average size residential landscapes. The photo of the tree above was taken four years after it was planted from a 15-gallon container and it rapidly grew even larger. 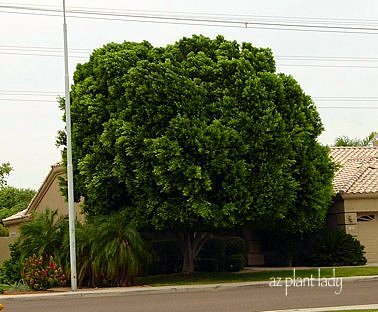 This tree made it’s debut in the Phoenix area about 15 years ago and rapidly became quite popular for its lush green beauty. However, as sissoo trees have been grown in the southwest landscape for several years, problems have begun to crop up. They have invasive root systems that cause problems with sidewalks, patio decks, pools, and block walls. In addition, their mature size is so big that they dwarf the landscapes they have been planted in. Sissoo trees are a better choice than ficus trees when used in large outdoor areas such as parks as they have greater tolerance to frost. https://www.azplantlady.com/wp-content/uploads/2011/08/Frost-Damaged-Ficus-1.jpg 640 444 arizonaplantlady@gmail.com http://www.azplantlady.com/wp-content/uploads/2018/10/favicon.png arizonaplantlady@gmail.com2011-08-31 12:36:002017-04-30 14:46:13Ficus Trees....Too Much Hassle? Excellent post!! I am writing about this tree in October during my 4 part tree series. The Ficus is quite the tree. I had a wonderful Jacaranda tree the provided wonderful shade and beautiful purple flowers; sadly the roots invaded the foundation of our house and I had to have it taken down. I have a Chinese Elm in the backyard and though it loses its leaves in winter, it's a great shade tree for the the rest of the year. I'm going to have to hire you sometime to take a look! My favorite spot in the garden is sitting under a maple tree. I was surprised that we had some Sissoo trees killed here in Wickenburg from the cold last winter, so they are not bullet proof! It's amazing to see such huge Ficus trees since here they are "houseplants", and very picky ones at that. My favorite shade tree is our big Japanese Maple. I call it our living sun umbrella. In regards to using a sissoo tree, I would advise against it in California, as it would most likely be even more invasive in regards to its root system. I don't confess to be an expert with California trees, but I would recommend that you visit the Thousand Oaks Botanic Garden to see what type of trees that they have growing. You may be able to see a few that would work in your garden. If you don't know what type of tree it is, take a photo of the entire tree and then a close up one of its leaves and bring it to your local nursery, who can help identify it for you. Thank you all your useful information about the Ficus. I cannot believe people are still recommending sissoo trees! The sissoo tree is considered as WEED tree in India! They are very invasive. They are one of the terrible trees. They may be fine when planted in a wide open space. 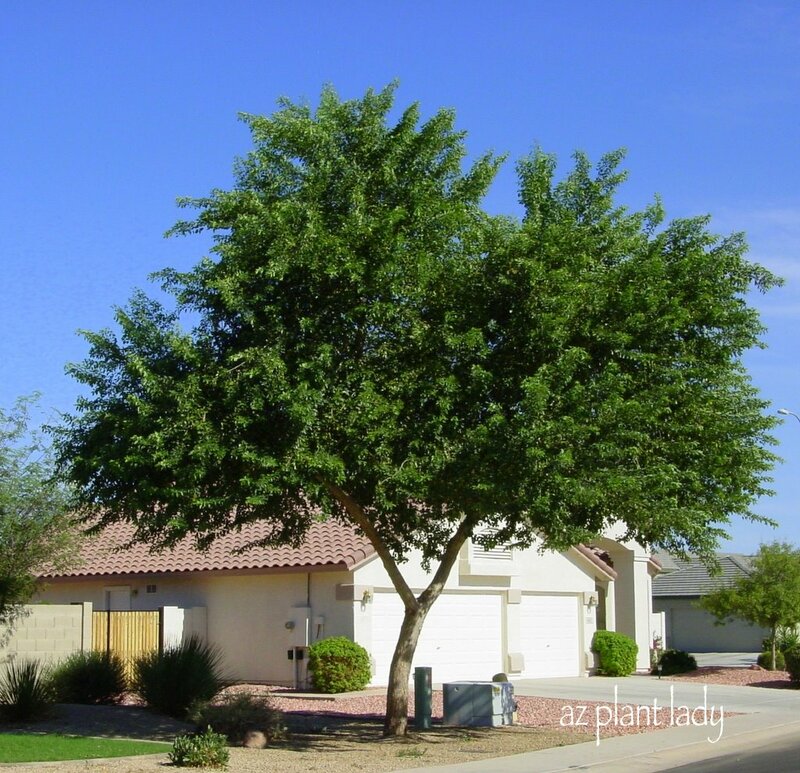 But for my knowledge, lots of HOAs require builders to NOT plant sissoo in the HOA maintained landscape areas. The Mulberry community in Mesa just spent thousands dollars to take out all the sissoo trees on their streetscape. because they don’t want to get suite by the HOA. Thank you for your comments. While it’s true that sissoo trees are considered to be invasive in parts of the world, they, like other plant’s invasiveness are controlled in our arid climate. It is true that if sissoo trees aren’t correctly maintained or planted in the wrong area that they are problematic. However, when given enough room to grow, with plenty of root space, and deeply watered as is recommended for all trees, they work in certain areas. Keep them away from grassy areas as their roots grow toward the surface as opposed to areas where they are watered by drip irrigation. I understand your dilemma and don’t recommend a ficus. I would strongly recommend planting a row of hop bush (Dodonaea viscosa), which is an evergreen hedge that is drought tolerant, looks great all year, and can grow up to 10-12 feet high. What do you think about Ficus nitida ‘columns’ as a hedge or screening plant? Does this variety get as big eventually too? I hesitate to spec them for a hedge because I’m afraid they will eventually get too big. I’m just curious about their growth habit compared to the regular Ficus natida. Great question! From what I have been able to research, Ficus nitida ‘Columns’ seems to point to how they have been trained and not to a different plant and growth habit as I haven’t been able to find any citation pointing to that (I could be wrong, but haven’t been able to find a source that it is in fact, a different plant). I would be leery of using it against a wall or near a grassy area or planting bed with shrubs as the roots will outcompete those plants for water, which will leave them stressed. I hope that this helps! I just went on line to find out how big the Ficus plant will get. I got a houseplant for Christmas a little over a year ago and it wasn’t doing to well so I decided to plant it outside in my back patio area. To my surprise, it has grown to over four feet tall and is still a bush, no a tree. I live in Sun City West Az and we do get a freez one in a while, so we cover it when we get the new report. What is going to happen when it gets too big for the patio area since it is planted next to my fence? There may well come a time that it will cause cracks in the patio, the foundation of your house, and fence. You may be pulling it out once it gets too big. I’m researching trees for the yard in our new house and came across your excellent blog. At first I thought tipu tree but after doing some research I don’t think it’s evergreen and clean. We’re retired and my husband is no longer able to do much yard work and hiring it out is not in the budget. I’ve seen how cold weather ravages ficus in the Vally of the Sun and I’m leary. Any suggestions for evergreen and clean that provides shade? Space is not a big issue, the yard is very low to the ground desert at this point. One more factor, we’re not young anymore so fast growing would be a plus. I hope you are still posting. I noticed a lot of these were from 2011. I have a dilema our neighbors that moved in not more than a month ago, we have yet to meet, have decided to go with a well known nursery here in Phoenix that has them planting Tipu trees right along their backyard fence that would block the view of their house which I respect privacy but they have also gone all along to the far north end of the wall where we get a beautiful view of a mountain range and no part of the house or yard they would use is there. They are planted no more than maybe 8 ft apart and already have 10 to 12 ft. trees planted. Ive heard from another friend who is a fantastic grower of all sorts of plants and is up to speed on different trees here in AS. My worry is they will block our beautiful view and really was unnecessary to plant so far down the wall. I have heard that some countries and some cities here in the U.S. have out lawed them due to their invasive nature. Any suggestions as to what we should look out for and if we get a chance to meet them see if they knew what they were getting? I have seen and heard the same story many times repeating itself. Many people have no idea how large trees will grow and the potential damage that they can do. Unfortunately, a neighbor’s tree can impede the view from others. Tipu trees aren’t invasive in our arid climate. I would talk to them about the mature size of the trees and how much maintenance that they will require as they grow into each other. I’d also mention the fact that your view will be altered. Chances are that they never considered that. Approaching them with kindness can often do wonders. I hope this helps. Hi I’m researching trees and I came across your fantastic blog! We live in Peoria, AZ and have a south facing window that gets blasted with sun in the hotter months and really would like to plant some sort of shade tree out there. Problem is, it is our side yard and it’s only 10′ wide between our house and the neighboring fence. Is it still possible to plant a small tree in that space without worrying about the roots hitting our foundation or messing with the fence? Thanks! Trees can be unpredictable when planted in close quarters. 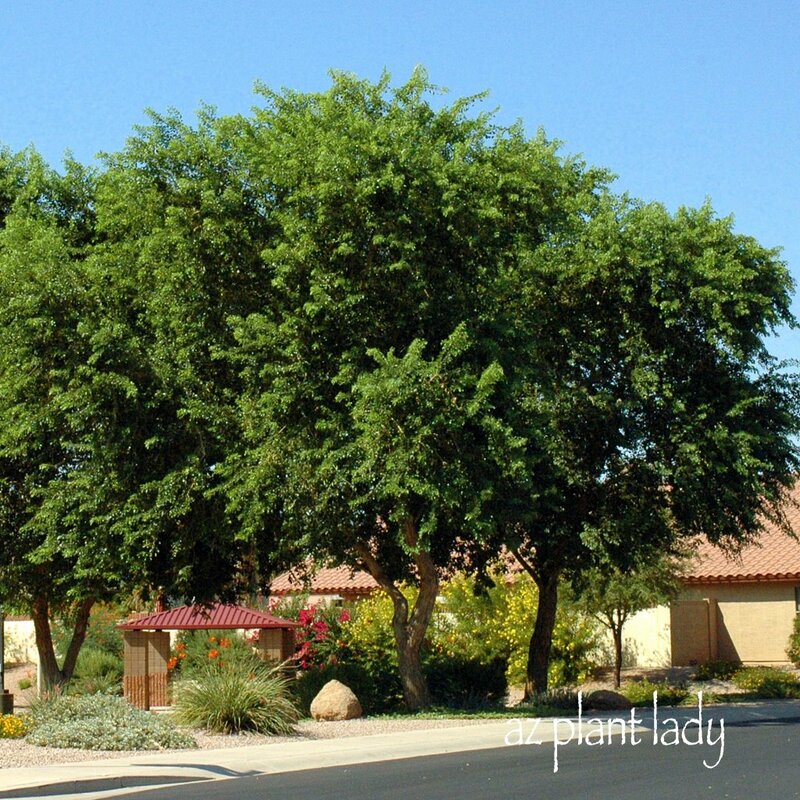 Your best bet is to plant a group of large shrubs that has been pruned into a small tree. Choices include hopbush (Dodonaea viscosa), Texas mountain laurel (Sophora secundiflora), or Mexican bird-of-paradise (Caesalpinia mexicana). Another option is to plant 3 ‘Orange Jubilee’ shrubs which grow 6-8 feet tall and will provide a nice green screen. I hope this helps! While the ficus trees are beautiful, they can cause problems with their invasive roots. You can see some that have little to no problem, but then there are situations where they cause a lot of damage. Fruitless olive trees are beautiful and don’t have thorns. I hope this helps! We have 19 ficus nitida trees in our office. The temperature is AC controlled and quite cold with decent sunlight. Do you have any suggestions of artificial lighting which will help in the tree growth. Currently we have 3 LED lights working at day light timings exactly above the trees. The growth of the trees seems slow, however we do not have any yellowing of the leaves as of now. I don’t have any experience growing these trees indoors. I would advise contacting a company that specializes in interiorscaping – maintaining plants in an indoor environment. A Beautiful Garden in the Middle of a Ghost Town Gardening at Night?